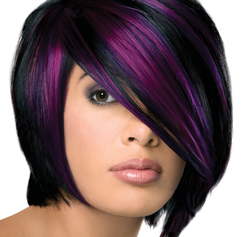 Pravana ChromaSilk is a low ammonia, non-organic permanent and semi-permanent color option. ChromaSilk is infused with silk and keratin protien to give hair a healthy and long lasting shine. Pravana hair care and color products are always free of parabens, sulfites, sulfates, cocamide DEA, formaldehyde, phthalates, and many other ingredients commonly used in cosmetic products but known to be harmful to users or the environment. This hybrid approach, which marries time proven botanical extracts and natural proteins with modern elements such as nano-amino acids and micro-polymers, provides hair care that is truly super-natural while also protecting the planet and its people. Pravana's anti-corporate philosophy goes beyond traditional product creation by redefining personal hair care with a caring commitment towards only the highest quality brand and product precision, underscored by a responsible and altruistic eco-conscious approach - which includes biodegradable packaging, natural, non-harmful ingredients and a built in charitable contribution for every purchase made. Higher Grounds Trading Co. roasts fair trade and organic coffee from around the world, with their roastery located right here in the heart of Traverse City, Michigan. Higher Grounds adheres to high standards not only for ethical and environmental reasons, but also because quality is of utmost importance to them. This local coffee company believes strongly in promoting organic agriculture and supporting fair trade, as well as continuing a close relationship with their farmers; Higher Grounds believes that these standards help to produce the best-quality coffee around.